Just when you feel that the art of pure movie making is dying (call it because of cgi in Hollywood or pure stardom in Bollywood) you come across movie like LION and you leave the theater with a contemplated heart and forces you to right something about it. It is this kind of movie which keeps on holding you with its true to the heart story and emotions which are very conveniently conveyed to you by the star cast. I would like to personally thank the individual who decided who decided to take this project. The movie unravels how a 5 yr old maa ka laadla, Saroo, turns out to be survivor and luckily tackles human trafficking twice seeing right through fake care and love showered upon him and who later gets adopted by an Australian couple only to return to India in search of his real mother and brother. The movie is emotionally loaded ; you feel the helplessness of the older Saroo who wants to desperately get back to his real mom and brother and his inability to commit to his relationship with his mom n gf because of the same. Saroo , at some point later, starts having hallucination of his birthplace and the incidences that occurred in his life which drive him to endlessly keeping searching for his family. You are also definitely going to get goosebumps when you hear the cry ‘Gudduuuuu’. Ps: Statistics tell that nearly 80,000 children from all over India and lost every year. It’s good that director also addressed this issue that is faced in INDIA through his movie. Very rarely has this been shown in Indian movies, last attempt as far as I remember, was made in the movie ugly, also which, came out as a story and not as a message. 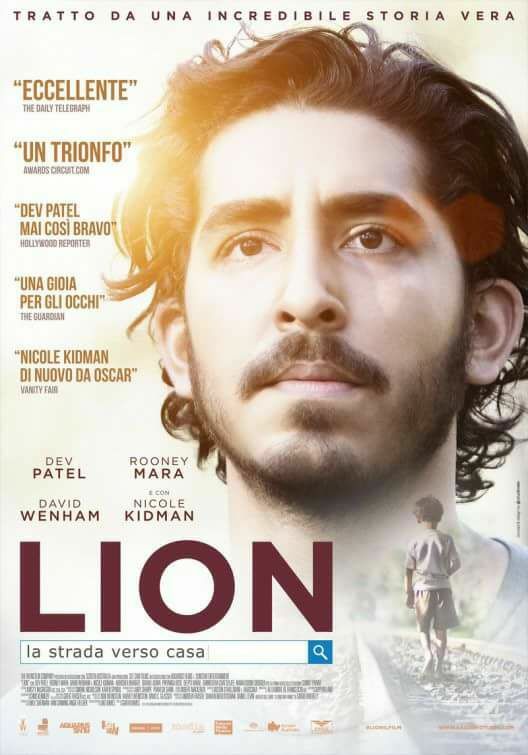 Also there is a meaning to the title of the movie LION and how its connected to Saroo. Do watch the movie for the same. The director does an excellent job on making this linear story along with glimpses of the past in appropriate places. Dev Patel did and excellent job and so did Sunny Pawar. Both of them leave an impression on you too difficult to forget. I would like to personally thank the individual who decided to take this project. The movie is emotionally loaded ; you feel the helplessness of the older Saroo who wants to desperately get back to his real mom and brother and his inability to commit to his relationship with his mom n gf because of the same. Saroo , at some point later, starts having hallucination of his birthplace and the incidences that occurred in his life which drive him to endlessly keeping searching for his family. You are also definitely going to get goosebumps when you hear the cry ‘Gudduuuuu’. Don’t forget to watch the movie this moment.